Capella Star Crystal Awards. 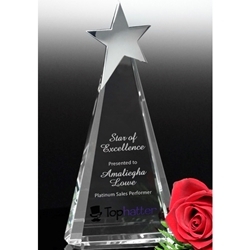 This magnificent award is ideal for your star recipient. The Capella Star is an exquisite optical crystal pyramid topped by a shining star. With ample space for a personalized message, this gift is sure to excite your recipient. This award is available in three sizes. Price includes your logo (if applicable) and 60 FREE characters of engraving in one location (simply specify where you would like your text in the order notes section of your shopping cart), a FREE proof, and a FREE black gift box for your award. Small: 3.5" wide x 7" tall x 1.5" deep, 2 lbs. Medium: 4" wide x 8.5" tall x 1.75" deep, 3 lbs. Large: 5" wide x 10" tall x 2" deep, 4.5 lbs. PLEASE ALLOW 1 WEEKS OF PROCESSING TIME AFTER PROOF APPROVAL BEFORE THIS ITEM SHIPS.